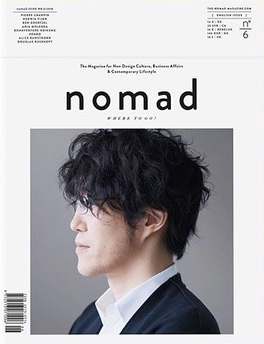 nomad is a magazine for design and society. For nomad, design is a process of shaping the future, and a catalyst for social developments and individual lifestyles. nomad seeks to change the perspective of design – from its status as an extraordinary phenomenon to a concept more rooted in the everyday: a progression that engenders natural appreciation. Alongside a focus on the end-result of the design process and the designers themselves, other aspects are explored and the effects and future potential of design culture, in terms of individuals and society as a whole, are investigated within the framework of a broader understanding of design. In this way, nomad aims to adopt new stances. The magazine offers views on a wide range of standpoints: personal and economic, cultural and global. By doing so, nomad covers a wide range of topics juxtaposing design, social and lifestyle issues with aspects of shaping the future, providing revelations and inspiration in the process.